Swimming Pools have one of the most difficult of environments to treat acoustically. With hard tiled surfaces surrounding the pool mixed with the sound of people swimming, playing and shouting the noise can reach extreme levels. 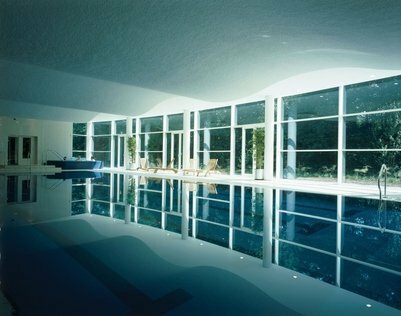 Swimming pools & leisure centres should provide an acoustic environment that allows people to enjoy their leisure time in peace, within a safe environment and our SonaSpray range is the perfect solution for swimming pool noise reduction treatments. SonaSpray fc in white was spray applied to a feature wave design ceiling (pictured left) acting as an ideal sound absorber without compromising on the design. It is spray-applied and covers this wave design ceiling with a joint free monolithic coating. It also helps to reduce condensation in the pool area when it is combined with the appropriate ventilation. SonaSpray will provide a large space with a bright, attractive ceiling coupled with perfect acoustics for years to come. Superior acoustic control, a highly light reflective finish, the ability to conform to any substrate configuration and an attractive, uniform texture makes our SonaSpray range the best ceiling finishes for new construction or renovation acoustic installation projects. 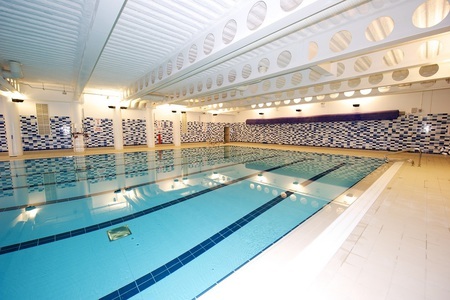 Swimming pool condensation control: When soundproofing areas such as indoor pools and ice arenas, SonaSpray aids in condensation control and cold bridging. The correct combination of SonaSpray and ventilation prevents condensation on metal, concrete and other similar surfaces. SonaSpray actually reduces ventilation requirements, saving in both the ventilation equipment cost and operating costs. RH control: SonaSpray is a natural humidity moderator. At times of increasing humidity SonaSpray will absorb large amounts of water vapour. When the humidity drops SonaSpray will exhale water vapour and maintain a balance. This characteristic promotes a healthy atmosphere and superb swimming pool acoustics. 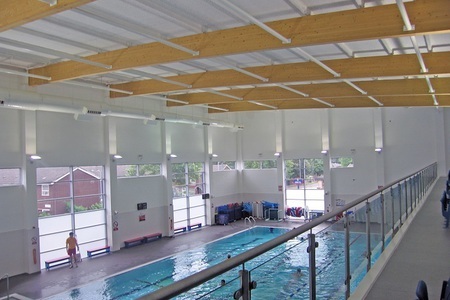 At the Harpurhey Leisure Centre swimming pool, acoustic design calculations demonstrated there would be a problem with speech audibility in the pool area due to high levels of noise reverberation. Oscar Acoustics was employed to apply 16mm of SonaSpray K-13 Special to the soffit in white. Swimming pool acoustics article by D.Mack of Oscar Acoustics.